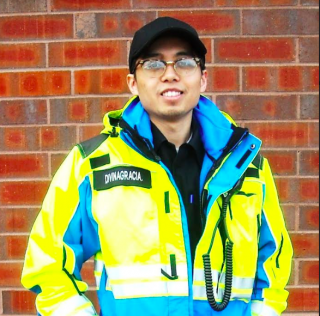 Emergency Medical Technician Robert Divinagracia must be able to physically lift patients and other heavy equipment, climb up and down stairs and handle other adverse conditions. With his partner, he is called on to treat patients of all ages and ethnic backgrounds at anytime during his twelve hour shift. The New City Volunteer Ambulance Corps responds to medical emergency calls 24/7, which are characterized as Basic Life Support. These responses cover breathing and cardiac emergencies that include Cardio- Pulmonary Resuscitation (CPR), use of the Automated External Defibrillator (AED) and obstructed-airway procedures for adults, children and infants. The goals of the Emergency Medical Technicians (EMTs) on board the ambulance are to provide urgent medical treatment to the patients and their subsequent transportation to the emergency departments of local hospitals. According to the website www.newcityems.org , each ambulance is equipped with an Automated External Defibrillator (AED) which is of critical value in cardiac emergencies. The AED is a portable device that checks the heart rhythm and can send an electrical shock to the heart to restore a normal rhythm. To improve response time, a Global Positioning System (GPS) street address locator was recently installed. This mechanism provides explicit road directions to the location of any accident area or medical emergency address. To enhance the GPS response device, an ‘Opticon System’ has been incorporated. This system can override a traffic signal light, permitting it to be changed as necessary in order to expedite movement in traffic. For additional information, e-mail the New City Volunteer Ambulance Corps at info@newcityems.org or call 845-639-7060.